Artist Marian Maguire's work combines Greek vase imagery with colonial New Zealand subjects. 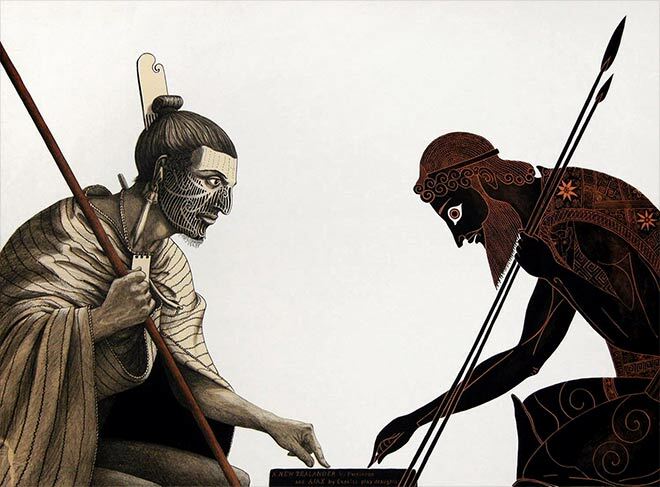 'A New Zealander by Parkinson and Ajax by Exekias play draughts' (2005) reworks the black-figure amphora painting of Achilles and Ajax by the famous ancient Greek vase painter Exekias, who was active between 545 and 530 BC. Here Achilles is replaced by Maguire's interpretation of Sydney Parkinson's 'Head of a New Zealander' figure, which in turn is based on a drawing Parkinson made during James Cook's first voyage to the Pacific in 1768. This lithograph comes from Maguire's series 'The odyssey of Captain Cook'.